A highly toxic chemical, dry cleaning fluid cleans dirty and soiled clothes and textiles without using water and detergent. No one knows for certain when the history of dry cleaning began. Although there are many stories told of its origin, many people believe the concept of cleaning clothes using chemicals began in the 1850s. It occurred completely by accident when a maid accidentally spilled kerosene from a lamp onto a tablecloth. The tablecloth belonged to a Frenchman in the dye-works business, Jean Baptiste Jolly. He noticed how much cleaner the tablecloth appeared where the kerosene had spilled. Impressed by the cleaning action of the kerosene, Jolly began offering the service of dry cleaning to his customers. Using percholorethylene became the favored method of dry cleaners and in the late 1950s had replaced the synthetic, highly flammable solvents trichlorethylene and carbon tetrachloride. Over the next two decades, it was found that using perc was harmful to the health of humans and to the environment. Yet in 2006, studies showed that 85 percent of the 36,000 dry cleaning shops in the United States still used this dangerous chemical in their business. The results of studies conducted by the National Institute for Occupational Safety and Health (NIOSH), which is part of the Centers for Disease Control's (CDC's) and the Environmental Protection Agency (EPA) include the health risks and dangers associated with this highly toxic chemical. As the world becomes more aware of the dangers of toxic chemicals in the air and water, alternatives to dry cleaning methods that do not use percholorethylene are being sought. Although alternative cleaning methods do exist, they are still being tested in regards to their effects on health and the environment. Using Stoddard solvent or hydrocarbons are two other non-perc dry cleaning methods that are being used and studied. The clothes are inspected and tagged for identification. The clothes are put into a dry cleaning machine along with the solvent and undergo the dry cleaning and drying processes. The clothes are inspected for any remaining stains. Any stains are post-spotted and removed. The items are finished using various methods such as pressing, ironing or steaming. Easy to use, home dry cleaning kits clean and freshen up fabrics that are labeled dry clean only or hand wash only. Home dry cleaning kits do not include any dry cleaning solvents. Although percholorethylene is available from online retailers such as Chemical Supermarket it is marketed toward researchers and students. Guardsman Dry Cleaning Fluid is available from Amazon and cleans heel marks and oil- based stains from fabrics that are dry clean only. Fabric Farms offers a fluid for dry cleaning fabrics and natural fibers. 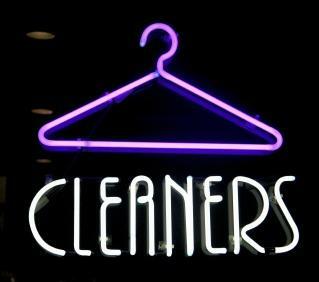 Dry cleaning fluid is a highly toxic chemical that should be used only by professional dry cleaners.